I had a great time visiting Michele. We really crammed a lot into the five days that I was there. After I drove to Kentucky and unloaded my car at Michele's house, she, Barb and I went to a nice quilt show at Lebanon, Ohio. One of the first vendor booths had these pieced hexagons. These blocks are from Katja Marek's book, The New Hexagon. This star quilt was just striking. The quilt was for sale along with other great quilts at a booth just inside the entrance. The quilts were reasonably priced, but being quilters, we wanted a pattern. Sadly, there were none. Here is another photo from that same booth. I would have loved to see this quilt unfolded because as you can see by how the colors are placed in the blocks, the yellow forms a pinwheel. This quilt was in another vendor booth. I love how the hourglass blocks have a subtle color variation that frames those nine patches. This star quilt was one of those on display. It is called momo's star quilt. I love this quilt with various feathered stars all done in black and white. This is a one block wonder. One day I want to make one of these. I know this could be pieced by traditional methods, but I would be tempted to do it using English Paper Piecing. If you look at this quilt one way you see rows of stars. Another way you see squares surrounded by a square in a square block. It could be constructed either way. Just look at these hexagon baskets. This quilt has lots of white hexagons for the background. This was one of my favorites. I am such a tourist! 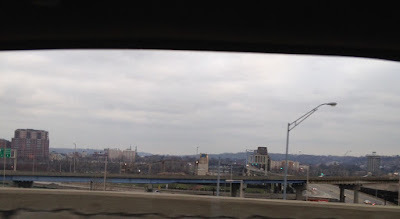 Each time we drove over the Ohio river, I took out my phone and took a photo of the river and/or Cincinnati. We were back and forth a lot during my stay. More in my next post. I'd like to interrupt the quilting to tell you that I have a new grandson. Malcolm Lyle Krug was born about 3 am March 14. Here he is when we went to visit him the evening of his birth day. That's me holding Malcolm. He is a little bundle of joy. He was born a little over 2 weeks early, but he is doing just fine. I tried to get him to open his eyes, but he was just too tired. I spent the night Sunday and most of the next 3 days with Malcolm's older brother Daniel. Daniel will be 4 next Monday. We celebrated his birthday early this past Sunday afternoon just in case the baby arrived before his due date. My daughter-in-law went into labor that evening so we celebrated Daniel's birthday just in the nick of time. My daughter-in-law is a teacher and very creative. The theme of the party was games. There was a Candyland cake. Vegetables, crackers, and cheese tray Chinese Checkers. The main course was french bread pizza made to look like Dominoes with mini pepperoni pieces and green peppers. If you follow me on Facebook, you've already seen this photo. Grandchildren are really a wonder and quite a lot of fun. I didn't get all the way unpacked from my visit to Michele's to see Bonnie Hunter and do a lot of other quilty things. More on that trip in my next post. As soon as I get rested, I'll get back to quilting. This is my Nearly Insane quilt, Lime Phosphate from 2008. Happy St. Patrick's Day. I've just had the best time. I spent a few days with my friend Michele in Kentucky, and while I was there we took the Talkin' Turkey workshop with Bonnie Hunter on Saturday in Cincinnati and attended her lecture and trunk show at the Ohio Valley Quilter's Guild meeting last Monday evening. The Talkin' Turkey pattern is in Bonnie's String Fling book. Here is me (on the left), Bonnie (center), and Michele (right). Bonnie is very enthusiastic and bubbly, and when you meet her in person she is just as warm and friendly as she looks in every photo you see of her on the internet. She posed for photos with us and autographed our books. A class with Bonnie has been on my bucket list for quite awhile now. If she came to the area again, I'd sure take another class with her. Monday night at the Ohio Valley Quilt Guild, Bonnie lectured about leaders and enders and showed quilts from some of her books . Those of you that read Bonnie's blog and visit her website more than likely use leaders and enders instead of sending a random scrap of fabric through at the beginning or end of whatever you are piecing. My machine tends to want to pull my beginning piece of fabric down underneath the plate on my machine. Keeping a stack of squares or flying geese to send through the machine before and after a project soon yields a stack of units to piece into another quilt. Here is Bonnie showing a small group how to use the Easy Angle and Companion Angle. 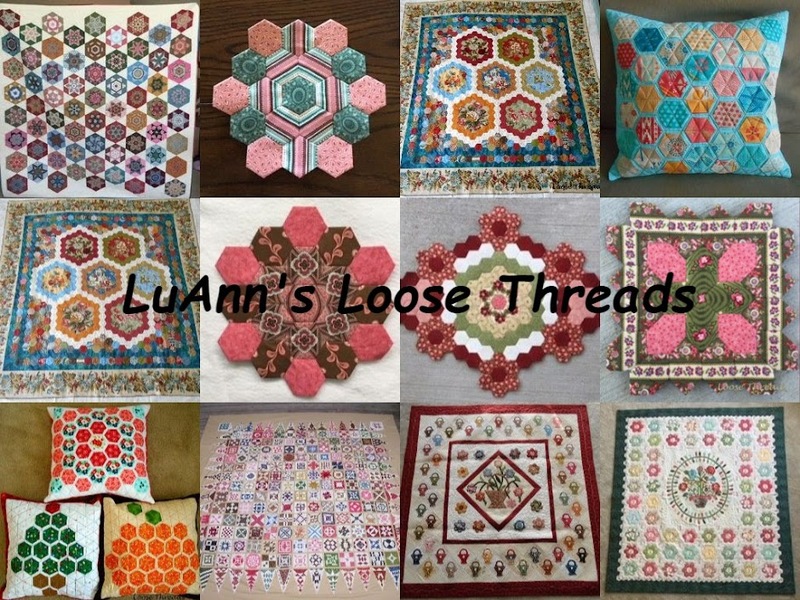 Here are some of her quilts that she shared at the guild meeting. Holding the quilt on the right side is one of my blog readers, Meredith. Those of you that blog know what a thrill it is to meet a total stranger that reads what you are writing! It was so nice to meet Meredith and have dinner with her! This quilt is Sister's Choice, a free pattern on the quiltville.com web site. This is Tumalo Trail from Scraps and Shirttails. This brown and blue one uses the Tri Recs tool. It is really something to see in person. I know you've seen these quilt photos either on Bonnie's web site or in her books, but they are really amazing to look at in person. This one is Blue Skies from her String Fling book. Here is Zuckerwatte (Cotton Candy) from String Fling. Pineapple Crazy from String Fling. This is an Easy Street from Show and Share during class lunchtime. I love this color combination. Bonnie brought her Allietare, this year's mystery quilt. I think I took a photo out of the car window every time we crossed over the Ohio River from Kentucky into Ohio. Here is row 1 of my Talkin' Turkey quilt from the workshop. While I was in Kentucky/Ohio, I also went to a quilt show, shopped at Fabric Shack, IKEA, and The Quilt Box. More on those in a later post. This was enough fun to last me for quite awhile. Michele and I sewed, talked, shopped, and had a fun time together. Thanks for the fun time, Michele! Here is my latest finished top. This is Easy Street, the Bonnie Hunter Mystery Quilt that finished in January 2013. This is top # 3 finished for the year. I had finished part of the blocks before this was packed up and taken to storage as a UFO before we moved. I realized that I had all of the parts pieced to finish the alternate blocks, so I've been working on getting this top pieced together. The photo on my monitor looks like part of the blocks are yellow, but they are all different lime fabrics. Most of them are batiks. I had fun at Back Door Quilts choosing the inner and outer border fabrics with the girls. Except for the border, the rest of the quilt was made from my stash.